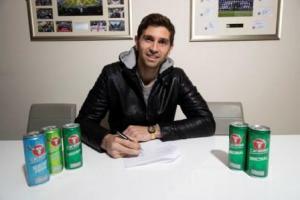 Reading Football Club can announce that Arsenal goalkeeper Emiliano Martínez has joined the Royals on loan until the end of the 2018-19 season. The Argentine stopper, 26, completed his medical this morning in time to join his new teammates in training at Hogwood Park. Drafted into the Gunners squad at the start of the following season, he made his Arsenal debut in a 6-1 Capital One Cup win over Coventry City – Olivier Giroud, Alex Oxlade-Chamberlain, Andrei Arshavin and Theo Walcott on target for the hosts that evening. He kept clean sheets in his first two Premier League starts as well – helping Arsene Wenger’s men beat West Bromwich Albion and Southampton. More first team experience at Arsenal followed in 2016 with clean sheets and wins in the Carabao Cup against Nottingham Forest and Reading – his second cup win over the Royals in fact – before starting in a 3-0 Premier League win over West Ham towards the end of that season. After another loan stint spent in Spain with Getafe, Emiliano has featured in Unai Emery’s squad on a number of occasions this season – but his sole appearance came in a 1-0 Europa League win over FK Qarabag last month.